BP Capital, the hedge fund of legendary oil tycoon T Boone Pickens (Trades, Portfolio), disclosed six new positions in its fourth-quarter 2018 portfolio, which was released earlier this week. Warning! GuruFocus has detected 4 Warning Signs with ENLK. Click here to check it out. The Texas-based firm, which transitioned to a family office structure last year, operates two energy-focused mutual funds. The portfolio managers invest in companies that will benefit from the changing landscape of the oil and gas industry in the U.S.
Based on these criteria, the firm established positions in EnLink Midstream Partners LP (ENLK), Marathon Petroleum Corp. (MPC), Continental Resources Inc. (CLR), Newfield Exploration Co. (NFX), Concho Resources Inc. (CXO) and Tellurian Inc. (TELL) during the quarter. Having previously closed out of a position in EnLink in the first quarter of 2016, the firm opened a new 225,100-share holding for an average price of $14.59 per share, dedicating 1.68% of the equity portfolio to it. The Dallas-based midstream oil and gas company, which was acquired by EnLink Midstream LLC (ENLC) on Jan. 25, had a $4.26 billion market cap; its shares closed at $12.05 on its last day of trading with a price-earnings ratio of 241, a price-book ratio of 1.06 and a price-sales ratio of 0.57. Pickens' firm held 0.06% of EnLink's outstanding shares. After selling out of Marathon Petroleum in the first quarter of 2015, BP Capital invested in 31,465 shares for an average price of $67.67 per share, allocating 1.29% of the equity portfolio to the position. The oil refining company, which is headquartered in Ohio, has a market cap of $42.07 billion; its shares were trading around $62.32 on Wednesday with a price-earnings ratio of 11.63, a price-book ratio of 1.84 and a price-sales ratio of 0.34. According to the Peter Lynch chart, the stock is undervalued since it is trading below its fair value. Marathon's financial strength and profitability and growth were both rated 6 out of 10 by GuruFocus. Despite issuing $6.9 billion in new long-term debt over the last three years, the company has sufficient interest coverage and a high Altman Z-Score of 3.16, suggesting it is in good financial health. Although the company has recorded a decline in revenue per share growth, its margins and returns still outperform industry peers. In addition, the company has a high Piotroski F-Score of 8, indicating a healthy operating environment. Of the gurus invested in Marathon, Andreas Halvorsen (Trades, Portfolio) has the largest stake with 1.04% of outstanding shares. Other top guru shareholders include Steven Cohen (Trades, Portfolio), Pioneer Investments (Trades, Portfolio), Jim Simons (Trades, Portfolio)' Renaissance Technologies, First Eagle Investment (Trades, Portfolio), Leon Cooperman (Trades, Portfolio), Paul Tudor Jones (Trades, Portfolio), Ken Heebner (Trades, Portfolio), Bernard Horn (Trades, Portfolio) and Richard Snow (Trades, Portfolio). Having exited a position in Continental Resources in the first quarter of 2018, the firm purchased a new holding of 41,440 shares for an average price of $50.46 per share. The trade had an impact of 1.16% on the equity portfolio. The Oklahoma City-based oil and gas producer has a $16.85 billion market cap; its shares were trading around $45.15 on Wednesday with a price-earnings ratio of 10.27, a price-book ratio of 2.84 and a price-sales ratio of 3.68. 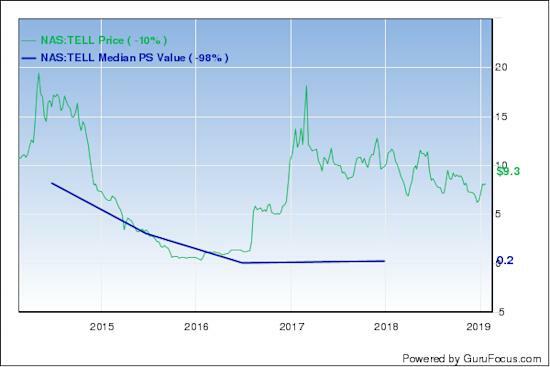 Based on the Peter Lynch chart, the stock appears to be undervalued. As a result of high debt and declining revenue per share, GuruFocus rated Continental Resources' financial strength 5 out of 10. While the company has adequate interest coverage, the Altman Z-Score of 2.21 suggests it is under some financial pressure. The company's profitability and growth scored a 6 out of 10 rating, supported by strong margins and returns, a high Piotroski F-Score of 7 and a one-star business predictability rank. GuruFocus says companies with this rank typically see their stocks gain an average of 1.1% per year. With 0.18% of outstanding shares, Cohen is the company's largest guru shareholder. Michael Price (Trades, Portfolio), Simons' firm, Caxton Associates (Trades, Portfolio), Murray Stahl (Trades, Portfolio), Pioneer, Jones, Ray Dalio (Trades, Portfolio) and Joel Greenblatt (Trades, Portfolio) also own the stock. Pickens' firm bought 86,472 shares of Newfield Exploration for an average price of $19.81 per share, giving the holding 0.88% space in the equity portfolio. The firm previously divested of a position in the first quarter of 2017. The oil and gas producer, which is headquartered in Houston, has a market cap of $3.28 billion; its shares were trading around $16.35 on Wednesday with a price-earnings ratio of 6.29, a price-book ratio of 1.75 and a price-sales ratio of 1.32. Weighed down by a decline in revenue per share over the last several years, Newfield's financial strength was rated 5 out of 10 by GuruFocus. While the company has adequate interest coverage, the Altman Z-Score of 0.89 warns it is in danger of going bankrupt. The company's profitability and growth scored a 6 out of 10 rating, driven by strong margins and returns, a high Piotroski F-Score of 7 and a one-star business predictability rank. 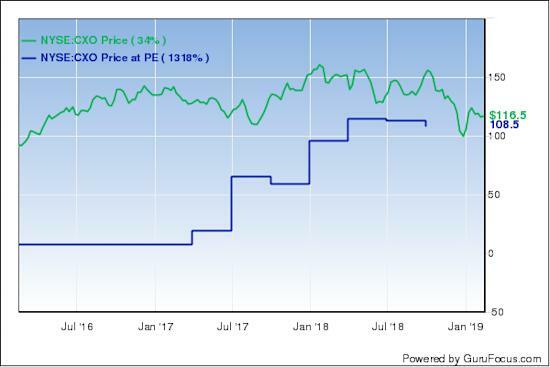 NWQ Managers (Trades, Portfolio) is Newfield's largest guru shareholder with 0.75% of outstanding shares. Dalio, Pioneer, Cohen, Ken Fisher (Trades, Portfolio), Jones and Louis Moore Bacon (Trades, Portfolio) are also shareholders. 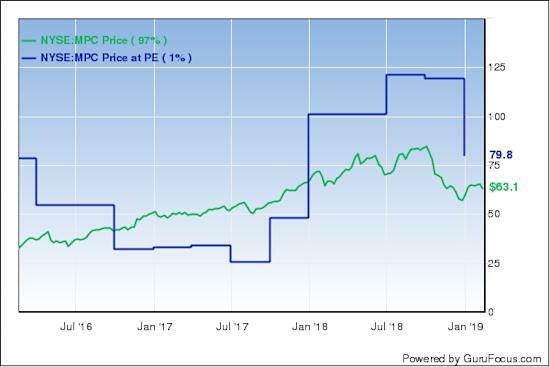 After removing Concho from the portfolio in the third quarter, the firm established a new 8,618-share position for an average price of $131.70 per share. The trade had an impact of 0.62% on the equity portfolio. 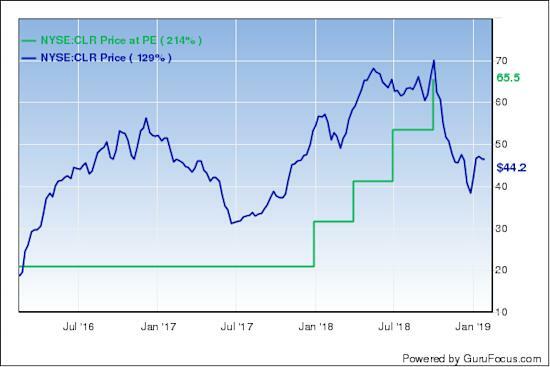 The Midland, Texas-based oil and gas producer has a $23.33 billion market cap; its shares were trading around $117.74 on Wednesday with a price-earnings ratio of 16.11, a price-book ratio of 1.35 and a price-sales ratio of 4.79. 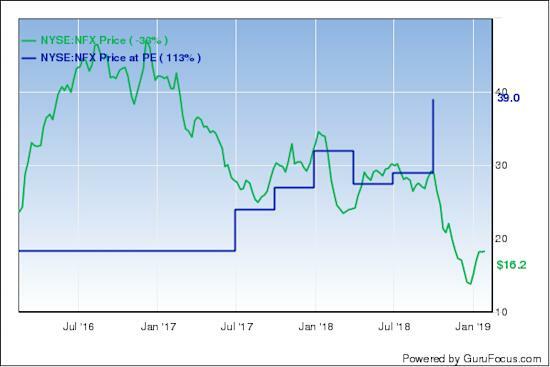 As a result of recording a decline in revenue per share over the last five years, GuruFocus rated Concho Resources' financial strength 5 out of 10. While the company has good interest coverage, the Altman Z-Score of 2.13 indicates it is under some financial stress. The company's profitability and growth fared a bit better with a 6 out of 10 rating, which was driven by strong margins and returns, a moderate Piotroski F-Score of 6, meaning operations are stable, and a one-star business predictability rank. With 2.02% of outstanding shares, Dodge& Cox is the company's largest guru shareholder. Spiros Segalas (Trades, Portfolio), Cohen, Ron Baron (Trades, Portfolio), Heebner, Pioneer, Leucadia National (Trades, Portfolio) and Bacon also have positions in the stock. BP Capital invested in 93,725 shares of Tellurian for an average price of $7.67 per share, giving it 0.45% space in the equity portfolio. The Houston-based natural gas producer has a market cap of $2.21 billion; its shares were trading around $9.50 on Wednesday with a price-book ratio of 6.80 and a price-sales ratio of 133.04. The median price-sales chart shows the stock is trading above its historical value. Tellurian's financial strength was rated 6 out of 10 by GuruFocus. Supported by a comfortable level of interest coverage, the robust Altman Z-Score of 13.23 suggests the company is in good fiscal health. The company's profitability and growth did not fare as well, scoring a 4 out of 10 rating as it has negative margins and returns and has seen its revenue per share decline over the last three years. It is strengthened, however, by a moderate Piotroski F-Score of 4 and a one-star business predictability rank. Cohen is the company's largest guru shareholder with 0.26% of outstanding shares. BP Capital holds 0.04%. During the quarter, the energy-focused firm also boosted several positions, including Energy Transfer LP (ET), Antero Midstream GP LP (AMGP) and Buckeye Partners LP (BPL), among others. BP Capital's $143.49 million equity portfolio is composed of 52 stocks.